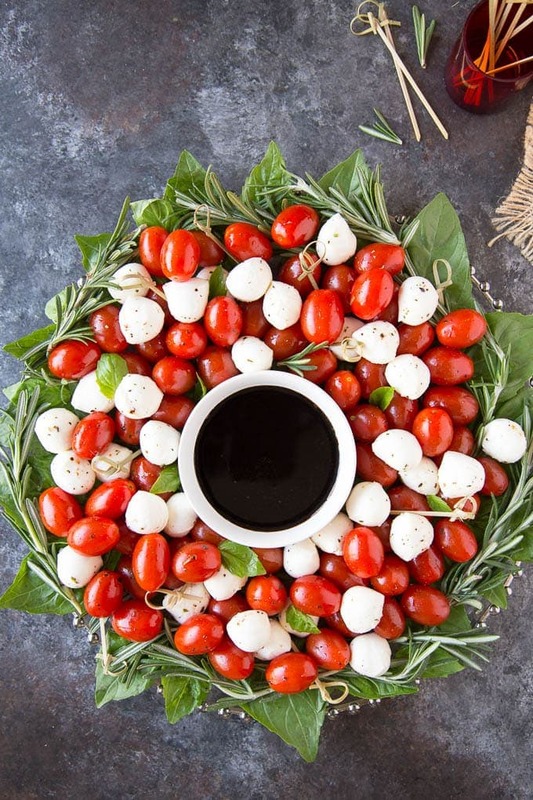 Caprese Salad Christmas Wreath- A festive presentation of the popular Italian caprese appetizer! Ripe tomatoes and fresh mozzarella get a punch of flavor from olive oil, herbs, red pepper flakes and are garnished with fresh basil . A balsamic reduction dipping sauce gives this appetizer the WOW factor. Ready in 15 mins. How did it already get to be the 21st of December? Ahhh….if you’re still looking for a super easy appetizer to serve this Christmas here you go! A fun and festive Caprese Salad Christmas Wreath. You really can have this ready in 15 mins. 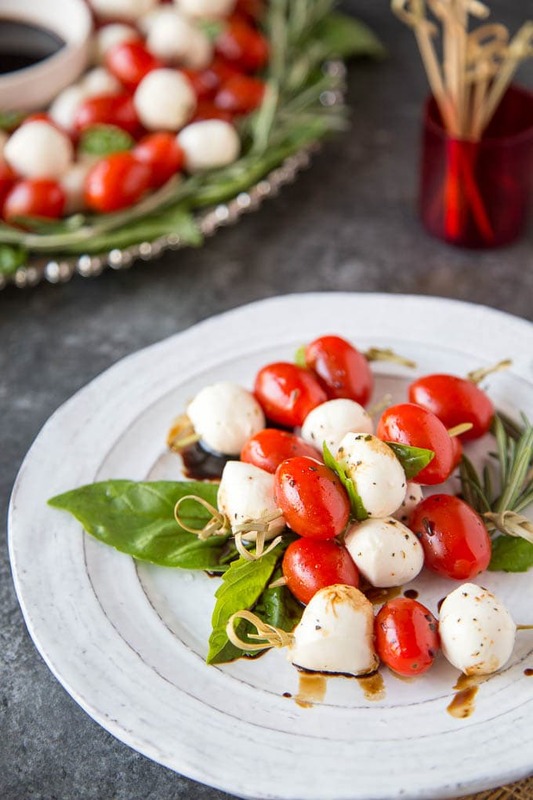 You’ll need some cherry/grape tomatoes, small mozzarella balls ( sometimes called “ciliegine”), balsamic vinegar, honey, olive oil, some fresh/dried herbs, salt & pepper. Start by making the balsamic reduction sauce. You’ll want to add the balsamic vinegar and honey to a small saucepan and bring to a boil. Reduce the heat to low and cook until the sauce has reduced to about one-third and thickened like syrup ( approx. 8-10 minutes). While the balsamic is reducing you can put together the rest of the appetizer. To make the “wreath” you can use a dinner plate or serving platter. ( 8-10 inches in diameter or adjust to fit the size of your gathering). Lay fresh basil on the bottom of the plate. I put the pointed end of the basil leaves toward the outside of the plate so they would look more like a wreath. In the center you’ll want to place a small round bowl or ramekin for the balsamic reduction sauce to be poured into ( and to form the center of the wreath) . Place the washed tomatoes and drained mozzarella balls in a medium bowl. Mix olive oil, herbs, garlic and red pepper flakes a small bowl, pour mixture over tomatoes and mozzarella to lightly coat. Arrange the tomatoes and mozzarella on top of the basil on serving platter. If you want you can add some fresh rosemary to the perimeter of the platter for a little extra holiday “flair”. Garnish with additional fresh basil ( leaves or chopped) if desired and course ground salt and pepper. Once the balsamic reduction sauce is ready, you can pour it into the bowl in the center of the wreath. Make sure to have some toothpicks/cocktail picks available so people can create their own mini caprese skewers ( and to dip into the balsamic sauce). 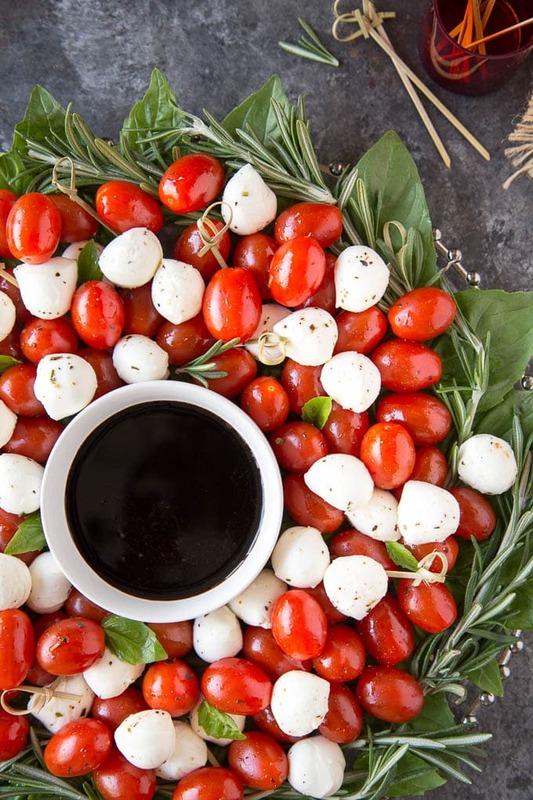 If a dipping sauce would be too messy for how you are planning to serve this appetizer you can always opt to put the toothpicks/cocktail picks in a shallow glass/ container in the center of the wreath and drizzle the balsamic reduction sauce over the tomatoes and mozzarella. For a slightly different twist, add some green/black olives. While balsamic is reducing prepare the "wreath" by using a round plate or serving platter (8-10" in diameter). Lay basil leaves on the plate/platter.to cover the surface. Place a small round bowl or ramekin in the center of the plate ( for balsamic reduction sauce and to form the middle of the wreath). Wash and dry tomatoes and drain mozzarella balls. Place in a medium bowl. In a small bowl mix together olive oil, herbs, garlic powder and red pepper flakes. Pour over tomatoes and mozzarella. Toss to lightly coat. Place tomatoes and mozzarella on the serving platter, and add course ground salt and pepper to taste. If desired place fresh sprigs of rosemary at the perimeter of the plate for an extra flair. Pour balsamic reduction sauce in the center bowl/ramekin and garnish with chopped or whole small basil leaves. * In lieu of individual herbs you can use 1½ tsp of Italian seasoning.